27 mm brushed stainless steel case, transparent back, domed scratch-resistant sapphire crystal with anti-reflective treatment both sides, black supernova dial with diamond hour markers, self-winding chronometer Omega 8520 movement with Co-Axial Escapement, date, and seconds, approximately 50 hours of power reserve, stainless steel bracelet. Water resistant to 100 m.
27 mm brushed stainless steel case, transparent back, domed scratch-resistant sapphire crystal with anti-reflective treatment both sides, white mother-of-pearl supernova dial with diamond hour markers, self-winding chronometer Omega 8520 movement with Co-Axial Escapement, date, and seconds, approximately 50 hours of power reserve, stainless steel bracelet. Water resistant to 100 m.
27 mm stainless steel case, transparent back, stainless steel bezel with engraved roman numerals, domed scratch-resistant sapphire crystal with anti-reflective treatment on both sides, white mother-of-pearl dial with a wavy pattern extending from the iconic claws, 11 diamond indexes, date window at 3 o'clock, calibre 8520 self-winding movement with co-axial escapement for greater precision stability and durability, approximately 50 hours of power reserve, stainless steel bracelet. Water resistant to 10 bar. 27 mm stainless steel case, transparent back, stainless steel bezel with engraved roman numerals, domed scratch-resistant sapphire crystal with anti-reflective treatment on both sides, blue mother-of-pearl dial with a wavy pattern extending from the iconic claws, 11 diamond indexes, date window at 3 o'clock, calibre 8520 self-winding movement with co-axial escapement for greater precision stability and durability, approximately 50 hours of power reserve, stainless steel bracelet. Water resistant to 10 bar. 27 mm brushed stainless steel case, transparent back, diamond bezel, domed scratch-resistant sapphire crystal with anti-reflective treatment both sides, black dial with stars, self-winding chronometer Omega 8520 movement with Co-Axial Escapement, date, and seconds, approximately 50 hours of power reserve, stainless steel bracelet. Water resistant to 100 m.
27 mm brushed stainless steel case, transparent back, diamond bezel, domed scratch-resistant sapphire crystal with anti-reflective treatment both sides, blue dial with applied 18K white gold stars, self-winding chronometer Omega 8520 movement with Co-Axial Escapement, date, and seconds, approximately 50 hours of power reserve, stainless steel bracelet. Water resistant to 100 m.
27 mm brushed stainless steel case, transparent back, diamond bezel, domed scratch-resistant sapphire crystal with anti-reflective treatment both sides, white mother-of-pearl dial with stars, self-winding chronometer Omega 8520 movement with Co-Axial Escapement, date, and seconds, approximately 50 hours of power reserve, stainless steel bracelet. Water resistant to 100 m.
27 mm brushed stainless steel case, transparent back, diamond bezel, domed scratch-resistant sapphire crystal with anti-reflective treatment both sides, black supernova dial with diamond hour markers, self-winding chronometer Omega 8520 movement with Co-Axial Escapement, date, and seconds, approximately 50 hours of power reserve, stainless steel bracelet. Water resistant to 100 m.
27 mm stainless steel case, transparent back, domed scratch-resistant sapphire crystal anti-reflective treatment on both sides, blue lacquered dial decorated with a feathered pattern, Caliber Omega 8520 self winding movement with co-axial escapement, chronometer, date, approximately 50 hours of power reserve, stainless steel bracelet. Water resistant to 10 bar (100 metres / 330 feet). 27 mm brushed stainless steel case, transparent back, diamond bezel, domed scratch-resistant sapphire crystal with anti-reflective treatment both sides, white mother-of-pearl supernova dial with diamond hour markers, self-winding chronometer Omega 8520 movement with Co-Axial Escapement, date, and seconds, approximately 50 hours of power reserve, stainless steel bracelet. Water resistant to 100 m.
27 mm stainless steel case, transparent back, diamond-set stainless steel bezel, domed scratch-resistant sapphire crystal with anti-reflective treatment on both sides, white mother-of-pearl dial with a wavy pattern extending from the iconic claws, 11 diamond indexes, date window at 3 o'clock, calibre 8520 self-winding movement with co-axial escapement for greater precision stability and durability, approximately 50 hours of power reserve, stainless steel bracelet. Water resistant to 10 bar. 27 mm stainless steel case, transparent back, diamond-set bezel, domed scratch-resistant sapphire crystal with anti-reflective treatment on both sides, White mother-of-pearl dial with a wavy pattern that flows between the iconic claws, 11 diamond indexes, date window at 3 o'clock, caliber 8520 self-winding movement with chronometer and automatic winding in both directions to reduce winding time, approximately 50 hours of power reserve, stainless steel bracelet. Water resistant to 10 bar. 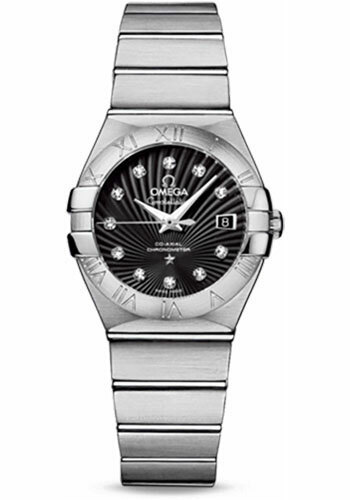 27 mm stainless steel case, transparent back, domed scratch-resistant sapphire crystal anti-reflective treatment on both sides, grey lacquered dial decorated with a feathered pattern, Caliber Omega 8520 self winding movement with co-axial escapement, chronometer, date, approximately 50 hours of power reserve, stainless steel bracelet. Water resistant to 10 bar (100 metres / 330 feet). 27 mm stainless steel case, transparent back, diamond-set stainless steel bezel, domed scratch-resistant sapphire crystal with anti-reflective treatment on both sides, blue mother-of-pearl dial with a wavy pattern extending from the iconic claws, 11 diamond indexes, date window at 3 o'clock, calibre 8520 self-winding movement with co-axial escapement for greater precision stability and durability, approximately 50 hours of power reserve, stainless steel bracelet. Water resistant to 10 bar. 27 mm stainless steel case, transparent back, diamond-set bezel, domed scratch-resistant sapphire crystal with anti-reflective treatment on both sides, Pink mother-of-pearl dial with a wavy pattern that flows between the iconic claws, 11 diamond indexes, date window at 3 o'clock, caliber 8520 self-winding movement with chronometer and automatic winding in both directions to reduce winding time, approximately 50 hours of power reserve, stainless steel bracelet. Water resistant to 10 bar. 27 mm stainless steel case, transparent back, domed scratch-resistant sapphire crystal anti-reflective treatment on both sides, Tahiti mother-of-pearl dial with 11 diamond indexes, Caliber Omega 8520 self winding movement with co-axial escapement, chronometer, date, approximately 50 hours of power reserve, stainless steel bracelet. Water resistant to 10 bar (100 metres / 330 feet). 27 mm stainless steel case, transparent back, domed scratch-resistant sapphire crystal with anti-reflective treatment on both sides, white opaline-silvery dial with silk-like pattern, red gold index markers, and red gold hands, caliber 8700 self-winding Co-Axial master chronometer movement with date function, approximately 50 hours of power reserve, brushed stainless steel bracelet with polished stainless steel bars. Water resistant to 100 m (330 ft). 27 mm stainless steel case, transparent back, domed scratch-resistant sapphire crystal with anti-reflective treatment on both sides, white opaline-silvery dial with silk-like pattern, diamond indexes set in red gold, and red gold hands, caliber 8700 self-winding Co-Axial master chronometer movement with date function, approximately 50 hours of power reserve, brushed stainless steel bracelet with polished stainless steel bars. Water resistant to 100 m (330 ft).